UK pop queen Adele just wrapped up her enormous Australian tour with two huge shows in Melbourne over the weekend, and now seems as good a time as any to reflect back on just how unbelievably massive her tour was. Live Nation have released the official attendance figures for Adele’s eight concerts across the country, and perhaps unsurprisingly she absolutely obliterated attendance records at every stadium venue she performed at. Kicking off in Perth in the final week of February, Adele sold-out Domain stadium with a crowd attendance of 65,000, the stadium’s biggest ever concert and fastest selling tickets. She then performed back-to-back shows at The Gabba that saw a record 120,000 total attendees over two nights, and which trashed the ground to such an extent that that the inaugural women’s AFL grand final has had to be moved from the stadium. Moving on to Sydney, Adele then managed to bring the biggest crowds into ANZ Stadium since the closing ceremony of the Sydney Olympics in 2000, with an inconceivable 200,000 people watching her perform over two nights. She didn’t stop there, smashing the attendance record at the Adelaide oval with over 70,000 in the crowd, before she wrapped the tour with back to back shows at Etihad Stadium in Melbourne. Etihad Stadium have told Music Feeds those shows brought in 75,000 and 77,300 respectively, breaking the peak attendance record two nights in a row. In total, more than 600,000 people came through the gates over the full tour. For comparison, Guns N’ Roses’ 2017 tour in February saw a total of 270,000 attendees across six dates. 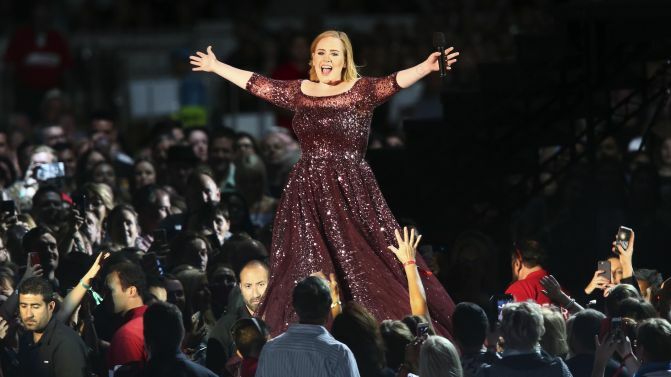 “The audiences have been ecstatic at their opportunity to see a true superstar at her peak, and, as the tour promoters, we have been gratified to be able to fully satisfy the expectations of Adele’s management, agent, production and security teams in the presentation of such a high profile and challenging series of major concert events,” said Live Nation Australiasia’s Chairman Michael Coppel. The tour was full of dramatic moments, from telling the Brisbane mayor to “shut up,” to a power outage in Adelaide, and finally in Melbourne a surprise on-stage marriage proposal. Check out footage of the surprise proposal below.